TheParrotCafe.com is thrilled to announce the release of our updated label for our same great coffee, Blue Tara Morning Dew Blend. 100% Parrot Friendly, Organic, Shade Grown, Fair Trade. 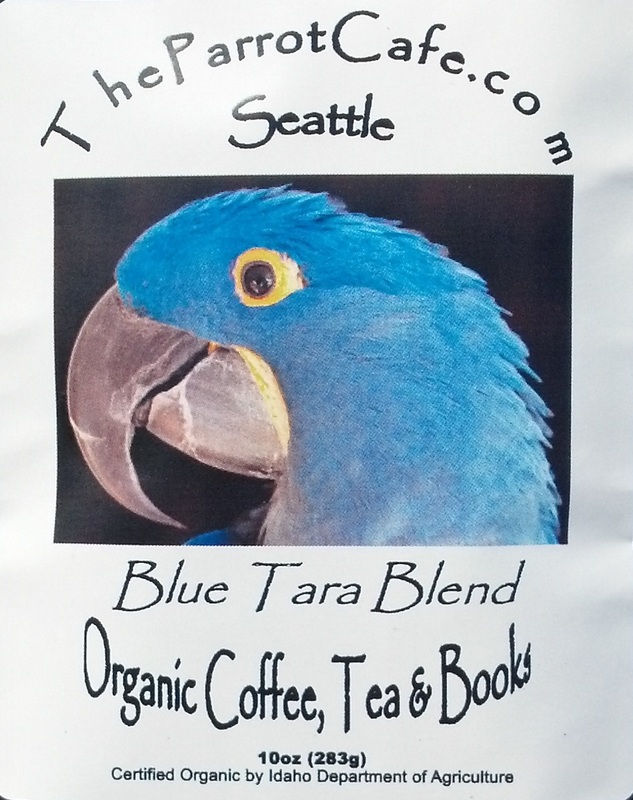 The Blue Tara Blend label features our Hyacinth Macaw Princess Tara. Princess Tara really is a princess. Her parrot parents are a Duke and a Duchess! Proceeds from the sale of all the fine coffee from TheParrotCafe.com support Northwest Parrots Fund, a 501(c)3 nonprofit charity registered in the State of Washington. In our humble opinion Blue Tara Morning Dew Blend may be the finest Organic, Shade Grown, Fair Trade breakfast blend on the market! Comprised of Sumatran and Central American coffees, this blend is complex and robust, roasted to different roast levels prior to blending resulting in a medium/dark roasted coffee that is so full of flavor it will knock your socks off! This coffee is extremely full-bodied. On the palate it has floral notes with hints of nuts and chocolate.